Bring a medium-size pot of water to a boil. Puncture the sausage links in several places, then cook them at a low boil until they’re no longer pink in the center, about 14 minutes. Transfer the links to a plate to cool, then slice them into 1/4-inch-thick rounds. Over medium-high heat, warm 3 tablespoons of the olive oil in a large, deep skillet or Dutch oven. Add the eggplant and zucchini and sauté them, stirring often, until they are lightly browned but not soft, about 7 minutes. Transfer the vegetables to a plate. In the same skillet over medium heat, warm the remaining olive oil. Add the onion and bell pepper and sauté them for 3 minutes. Stir in the garlic and sliced sausage and sauté, stirring often, for 3 minutes more. 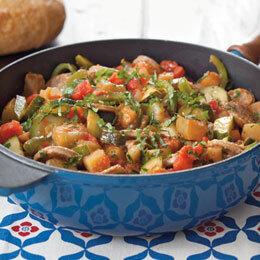 Stir in the tomatoes, eggplant, and zucchini. Partially cover the skillet and gently simmer the ratatouille for 5 minutes. Add the tomato paste, along with salt and pepper to taste, and simmer 5 minutes more. Stir in the parsley and half of the basil. Serve hot, sprinkled with the remaining basil. Serves 6. Top the creamed filling with 2 cups fresh sliced peaches. Then Glaze with 3/4 cup sugar, 5 t. cornstarch, 1 1/2 cups cold water, 3 oz. package peach Jello. In saucepan combine sugar and cornstarch. Stir in water until smooth and bring to a boil. Let thicken, then remove from heat. Stir in gelatin until dissolved. Let cool and spoon over peaches. Great cool refreshing summer dessert! 1. Bring 1 inch of water to a boil in a Dutch oven. Add corn, cover and cook until just tender, about 3 minutes. When cool enough to handle, cut the kernels from the cobs using a sharp knife. 2. Meanwhile, place pine nuts in a small dry skillet over medium-low heat and cook, stirring, until fragrant and lightly browned, 2 to 4 minutes. 3. Whisk lime juice, oil, cilantro, salt and pepper in a large bowl. 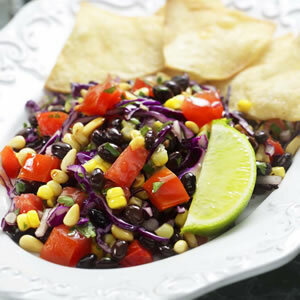 Add the corn, pine nuts, beans, cabbage, tomato and onion; toss to coat. Refrigerate until ready to serve.